I prefer the charm and chaos of old Belgrade to the order and grid like layout of New Belgrade. The hidden away side streets with their surprising range of small shops and bars to the order and neatness of the shopping centres of New Belgrade that, once inside, could be anywhere in any Western City. An exception to this feeling is the swathe of park land that runs from the site of the abandoned Museum of Contemporary Art along the banks of the Danube to towards Zemun. Along the tracks that cross this park and hug the banks of the Danube the population relax and play. History simmers, never far below the surface. Runners run, skaters skate, cyclists cycle and lovers walk hand in hand. 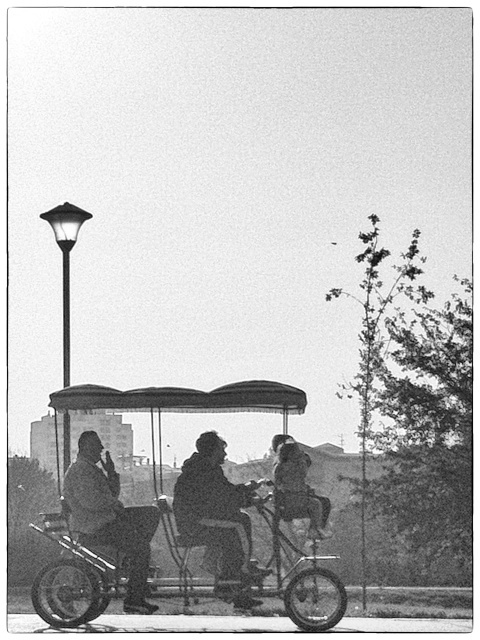 People sit on benches in quiet contemplation watching the sun set over the ‘bloks’ of New Belgrade. Non stop party people throng the riverside bars, restaurants and ‘splavs’. History is never far away. A walk of just a few hundred meters takes in the controversial ‘eternal flame’ a memorial to those that died in the NATO bombings of 1999, the largely abandoned building completed in 1961 to house the machinery of government, the ‘Savezno izvrseno vece’, the Jugoslavija hotel, also a victim of the 1999 bombings and the nearby monument by Miodrag Zivkovic to the pilots who defended the skies of Belgrade in 1941. A walk that defines Belgrade. History. The horror of war. The joy of the people who party until the sun rises. The life that is belgradestreets. so, i just discovered i could browse the photos by month! and i’m glad i did. could you tell me where the second photo was taken. the one that reads “Домовини… Бранко Миљковић”? Branko Miljkovic is my favorite Serbian poet, if not favorite poet of all..
i actually quite enjoy these photos from the “earlier period”…it’s really kinda amazing the transformations the images have undergone since the very first post… good job, honestly!